As is probably evident by reading this blog, I am a long-term fan of the discbound notebook system, especially the Levenger Circa notebooks. I didn’t discover them in time to use them in grad school (sadly, because how perfect would these be for college!?) but I have been using them as my primary note-taking system in the workplace since 2006. 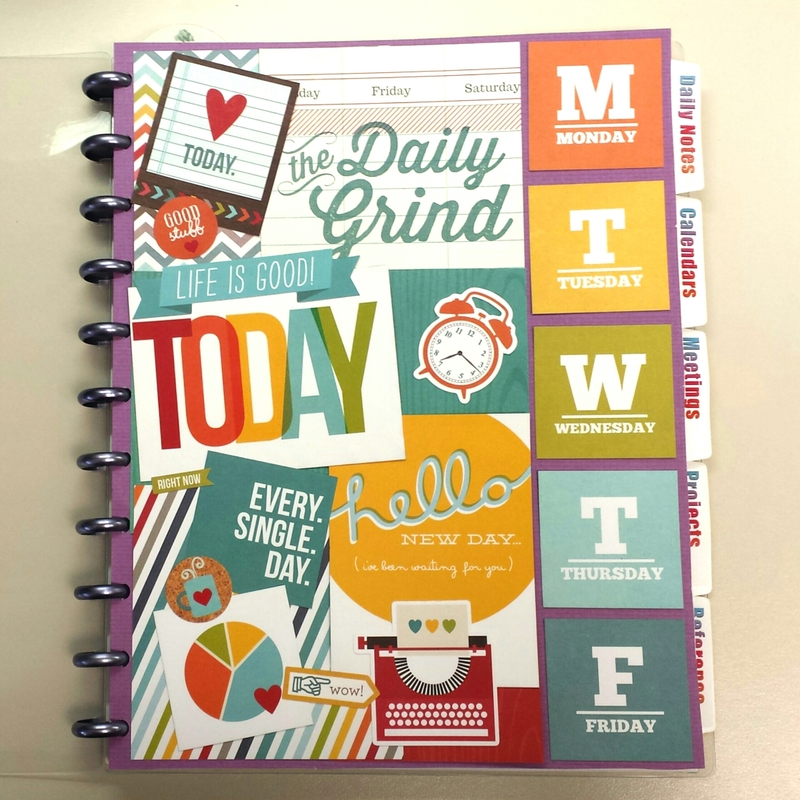 I was ready for a change from the steno notebooks I’d been using as my “brain dump” notebook at work – you know, that place where all the todos, convos with the boss, voicemails, all that kind of stuff got documented. And since the beginning I’ve been using primarily the letter-size notebooks, with divider tabs to keep things organized. I’ve used various leather covers in the past, but particularly like the clear plastic covered notebooks, for two reasons. 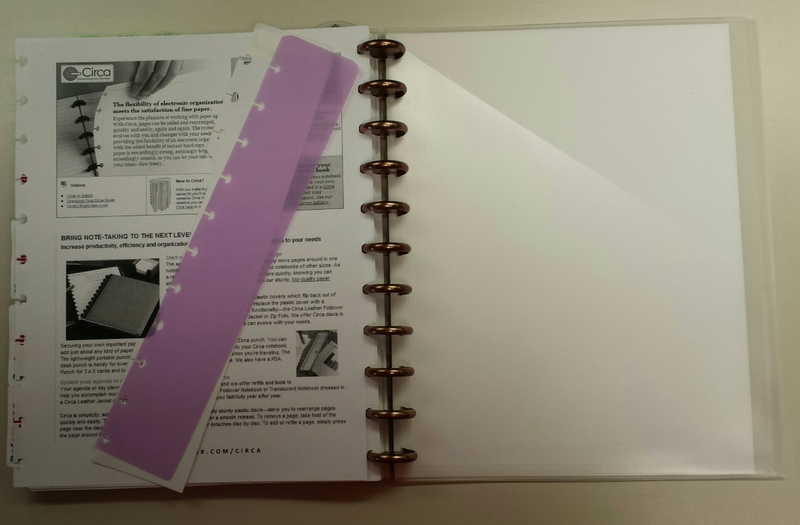 1) you can customize the notebooks depending on your mood with scrapbook paper flysheets behind the clear plastic, and 2) the covers add no bulk, so the notebook folds over on itself easily and without causing the pages to fall out. This week I finished creating a new cover for the latest iteration of work Circa, and thought it would be a good time for a quick walkthrough. The cover I made out of SN@P! brand scrapbooking cards and embellishments from these two sets: the Everyday SN@P Pack and the Daily Grind SN@P! Pack. This is only a few of the cover cards and such, and the quotes are a little cheesy, but I like the combo. I originally affixed them with double-sided tape, but need to go back and use the Elmer’s because the tape is already coming up. You can see the edges sticking up already. 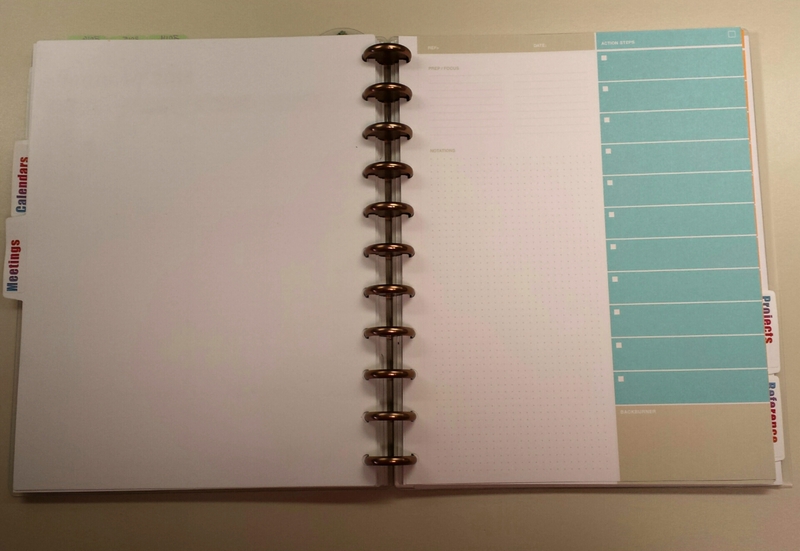 In the pic above, the notebook has 3/4″ Levenger Circa aluminum discs in “Caribbean” that really are a light purple. I already had to swap out the discs the same day though, the 3/4″ was feeling a little snug with some of my additions. So out comes the 1″ copper! Not quite as matchy-matchy as the “Caribbean”, but oh well. Of course, had to make divider labels to match! These are white Levenger divider tabs with Avery Labels #8167. So here are the sections as is so far. First, my Daily Notes section. Designed as my daily brain dump page, I track my time spent on projects/meetings, todos, phone calls, everything that happens during the day. 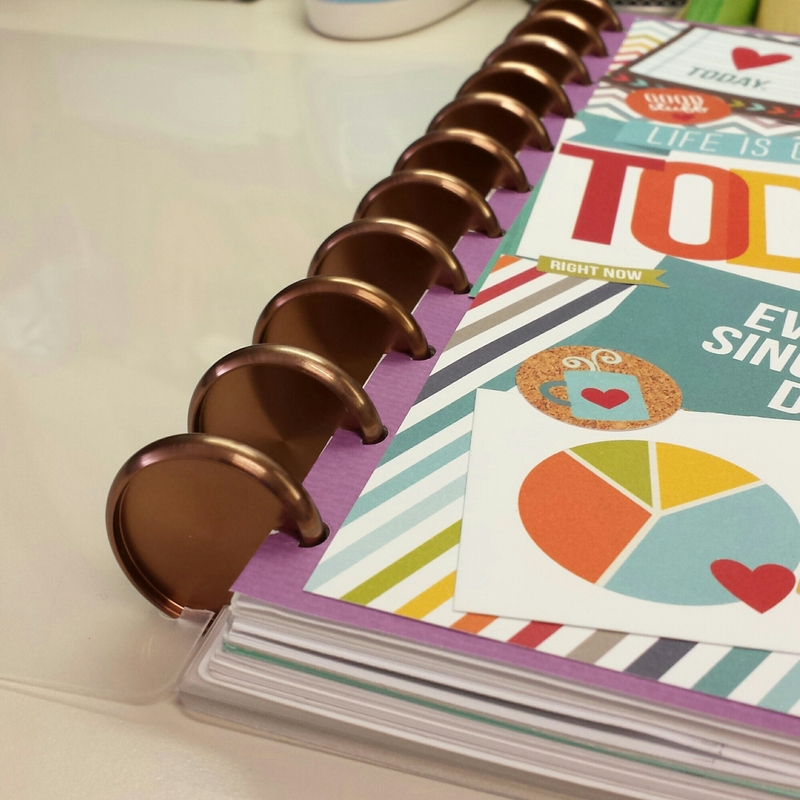 The front has a section for appointments, todos and notes, and the back is a full page grid for overflow notes (the template here is available to download, click on the page link for “DIY Planner Templates” above). When the notebook gets too full, I pull out about a month or two of these pages and stick them in my work archive notebook, a plain poly plastic on 1″ that I keep on a shelf so I can refer to it often. Next is the Calendars section. 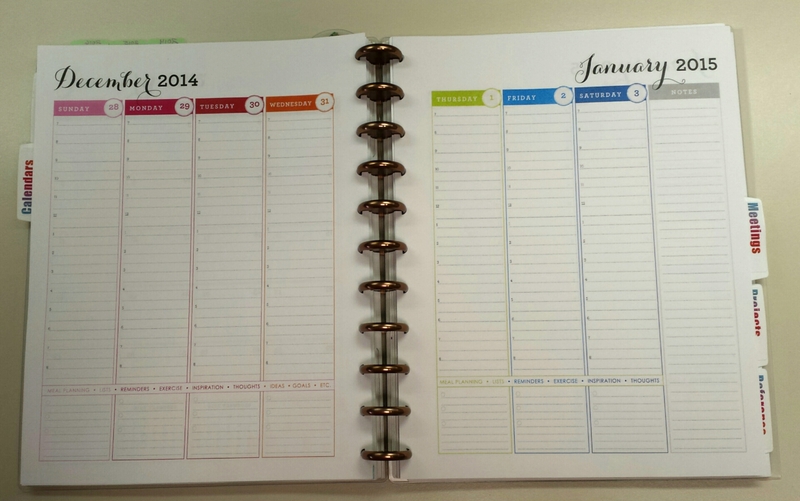 The long-standing Year-On-2-Pages has been my mainstay for awhile here (also available under “DIY Planner Templates”). I have flags at the top for easy reference to year. 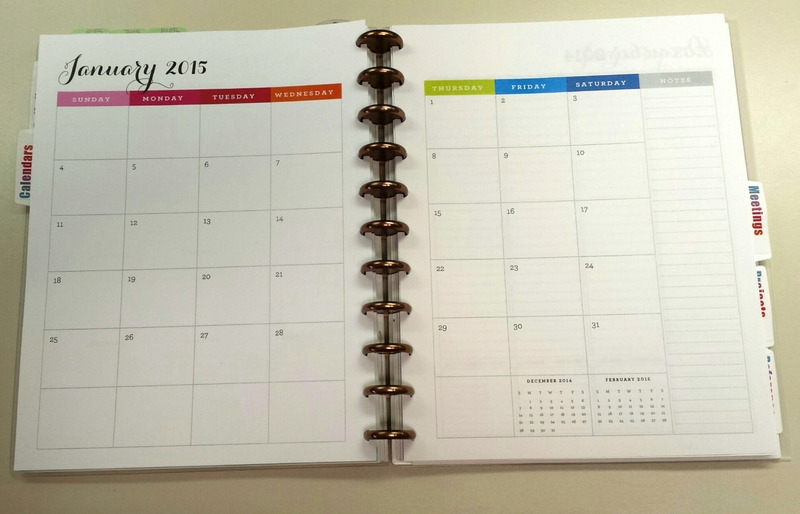 I don’t usually use monthly calendars, as for work most stuff is kept electronically. 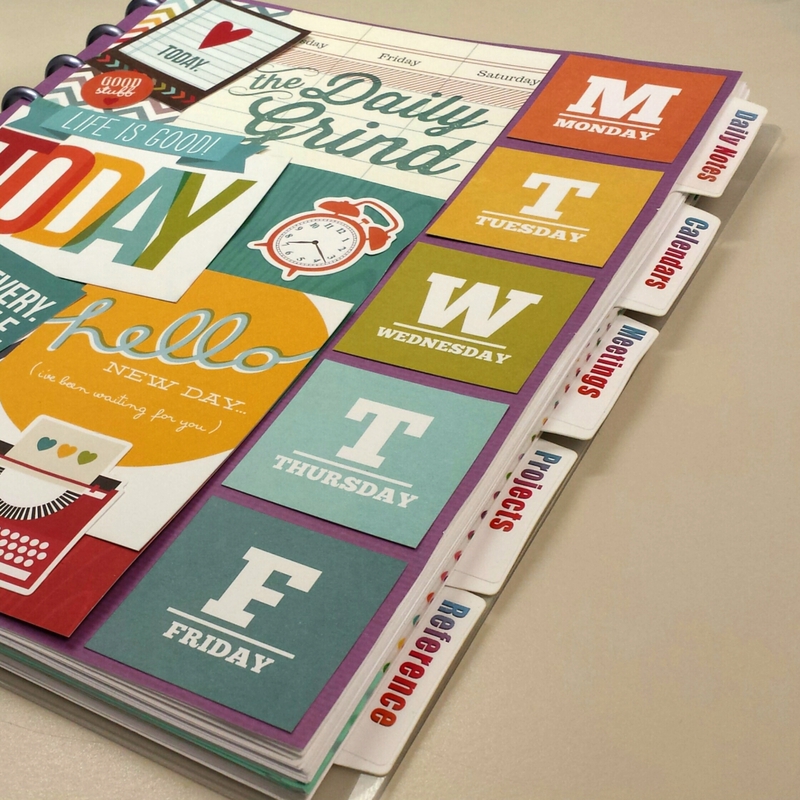 But I like the look of this 2015 Planner from 505design on Etsy, so am debating whether I want to try them out long-term or not. 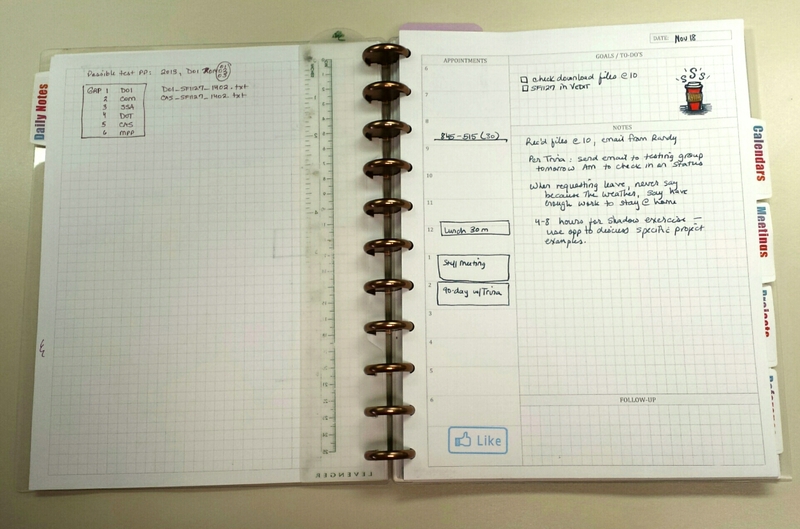 There is also a weekly planning view, which is nice too. Don’t know if it will be redundant to my daily pages or not yet. So this is still in beta-testing. Next is the Meetings section. I had some old Levenger Circa Action Method refills I stuck in here, along with some extra ruled and dot grid pages. Projects doesn’t really have anything yet. I am using it more as a file place for specific items I working with. Reference is more anything I want to keep around in my notebook, so right now is pretty empty too except for some holiday leave calculations haha. In the very back of the notebook, I always have an “info” sheet about Levenger in case I get asked about it (silly I know), and a MS pocket divider. And some extra page finders. And that concludes the overview of my work Circa notebook! I like the layout that you are using! I started using discbound system some months ago and it has proven very helpful for me. I am seeking ways of improving that will be more custom to my needs personally and professionally. Thank you for sharing! Hello! 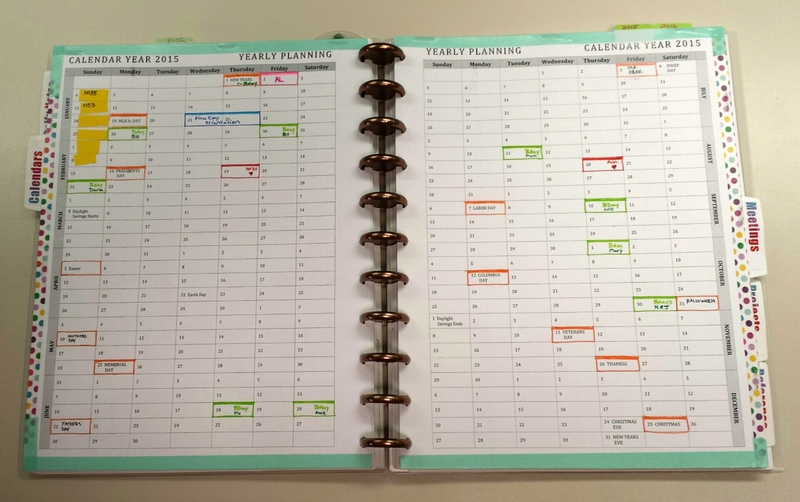 I just stumbled upon your blog on my obsessive quest to design my own custom planner for 2015 – I am both super excited, and a slight bit concerned to have found someone even more obsessed with the Circa / discbound system as I 🙂 You may be a bad influence! I’ve used and loved Levenger Circa system for almost 6 years now, and I just wanted to say thanks for the amazingly helpful posts, and for shedding light on your “process” as well – reminds me that this really is just one big, ongoing experiment…My most burning question / conundrum for some time however, is whether or not to keep a separate planner for personal and work life? I own my own business (turning into 2-3 businesses really), so I find that my business life is full as it is, and I feel like my personal life gets either overlooked, or just doesn’t fit into the same “containers”. My concern with separating the two however, is that I feel I am creating more work, and ultimately confusion by not having one central “hub” for my paper life. Thoughts and experiences welcome 🙂 Thanks again!